The winner of the 2016 Barbara Jefferis Award is Peggy Frew, for Hope Farm. With prizes totalling $55,000, this important award represents one of the highest prize pools in the Australian literary landscape. 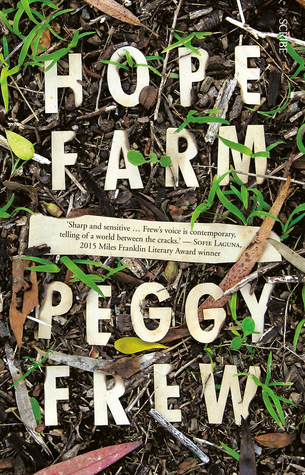 Peggy Frew: Hope Farm (Scribe Publications) See my review. Charlotte Wood: The Natural Way of Things (Allen & Unwin) See combined reviews. Mireille Juchau: The World Without Us (Bloomsbury) See my review. You can read an interview with Peggy Frew at The Age. Glad to see this book get some recognition. Charlotte Wood has, rightfully, picked up a swag of Awards this year but Peggy Frew’s novel has seemed to sit in the shadows when the prizemoney is handed out. I had reviewed this as part of my Stella Prize reading. I was a bit surprised by the BJ shortlist, but still, I am pleased she’s won it. Oh – good – I have this on my TBR list and this is a bit of a reminder to read it. I’m happy for Peggy Frew. It’s nice to see the prizes shared around, and I think that works when there’s no standout title that deserves to win everything. Hmmm… interesting… I read this when it was shortlisted for the Stella. It was an enjoyable read, but nothing particularly special, IMHO. Well, I thought so too, but the shortlist didn’t seem strong to me anyway. The only other one on the shortlist I had read was The Natural Way of Things, and, frankly I was surprised it made this shortlist because it seemed to me it was more about women as victims than showing them in a positive light.